Café du Palais is the type of brasserie that happily makes no bowing to modern cooking. The closest to this unique style of French brasserie cooking that can be found in Australia is Melbourne’s Fance Soir. 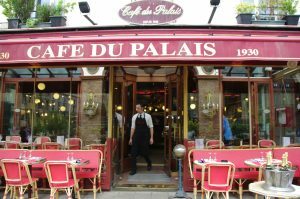 Yes, Café du Palais is the type of brasserie frequented by tourists however, at a packed lunch service we were the only diners ordering with what we have come to call our ‘français tragique’, apologising for it in advance does mean we are cut some slack. The walls of Café du Palais are plastered with wonderful paintings that range from conventional, to bizarre, to fascinating. An incredible deco ceiling and massed mirrors reflect …odd bits of sculpture, our favourite the naked beautifully breasted and horned, life size woman guarding the Champagne bowl, filled with of course, Champagne! 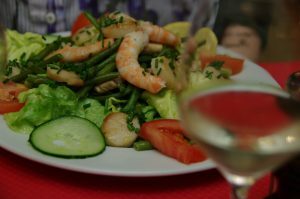 My companion chose Salade de Saint Jacques tièdes et grosses crevettes, [salad of scallops and prawns] and I ordered Ris de veau avec champignon [Veal sweetbreads with champignon sauce]. The best way to describe this food is stoically and deliciously old fashioned but, what is immediately apparent is the attention to produce and there is no compromise to small fussed about portions. A complimentary amuse of a little pot of excellent pork rillettes came with a generous basket of good bread and quite incongruously two small pieces of frittata. My companion’s salad was a mountain of delicate butter lettuce and runner beans…every leaf dressed with a tasty dressing with a very slight mustardy olive oil/vinegar dressing and garnished with slices of tomato and cucumber. Scallops had been quite thinly sliced and just slightly overcooked but the prawns were very good and the generous scattering of chopped chives was more than a garnish adding a finishing flavour to an already good dish. The sweetbreads were beautifully and correctly prepared, soft and succulent in a properly seasoned champignon sauce, finished with a splash of white wine and a dash of cream. The mash potato was divine, clearly made for the lunch service it did not have the miserable taste of reheated mash that prevents me ordering it in most Australian restaurants. Plated on a hot plate, garnished with three cherry tomato halves the plating was directly from my treasured first edition Larousse Gastronomique published in 1938. 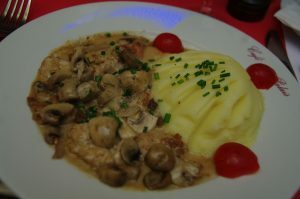 It is true that a champignon sauce can be rather bland when there are so many other tastier varieties of mushrooms to choose from, but they are perfect when properly cooked and seasoned for the delicacy of sweetbreads. Our scraped clean plates were a testament to our enjoyment. 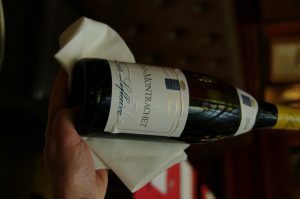 Washed down with a sublime Olivier Leflaive Puligny Montrachet 2014 [white burgundy] we were purring like fat, lazy, old cats basking in sunshine. The wine list was pronounced splendid by my companion who is known to be a Burgundy guru. 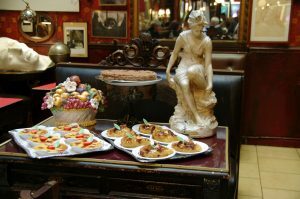 It should be noted that Café du Palais opened in 1930 and it would seem that very little has required refining since then. It has been a long time since I have watched almost every diner in a packed restaurant order dessert or for that matter a dessert table [pictured above] laden with classical choices….. a joy to behold. It should be noted that the French do not hold to the stupid rules we have in Australia about displaying food and preventing diners from breathing on them. The French classics Oeufs a la Neige came prettily, and properly plated with a mountain of meringue swished up with toffee and were the clear favourite as they were rushed by the dozens from the kitchen. Tarte d’Isabelle is a proper apple tart, Crème Brûlée which everyone now knows and add to that brilliant seasonal cheese selections and a very nice ice cream and sorbet selection. All desserts, are of course house-made and whilst we abstained were clearly good as licked clean plates returned to the kitchen.